Each stone holds a capsule that contains either ashes or small memorabilia in an inner cavity. 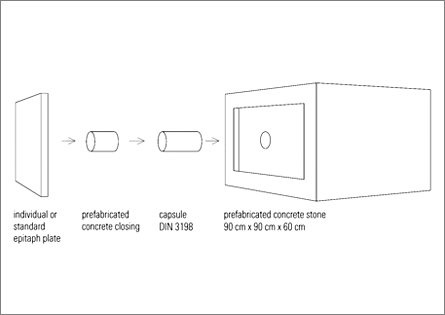 The stones’ contents will be permanently sealed in a compact concrete enclosure. Great Pyramid stones will be pre-fabricated in the Pyramid’s economic vicinity. The stones’ measurements are designed to suit the pyramid’s specific angles and proportions. Linkages will ensure that the stones fit snugly into place when set. Stones are all the same size, but can be customized with highly-individualized epitaph plates. These epitaphs may be engraved in natural stone, carved wood, or limestone, or even large-format photos laminated between acrylic glass and solar-powered LED-panels. Funeral or memorial parties may actively take part in a stone assembly celebration that would replace the act of covering a grave with soil in a pre-pyramid sepulcher.